There is always an issue one way or another. I don't know what has changed besides the new map, chat features etc. but we could of done without stat page changes. I have never, ever, in the past year I have played this game had frame rate issues, and 2 days before you guys implement a new release it seems like my frame rate is instead of at a consistent 60 now running at 35-50. I don't know if you've made server changes recently, and this is the effect of it, but it's really frustrating. I have downloaded, deleted, reinstalled, hard reset my device, restarted modem, speed net tested my ping, and have 0 issues on my end. So I installed on my phone, Galaxy 6s not old.... And it's even worse! I am one of the players that buys a war chest every couple months, who's in game every day. We deserve some kind of answer to the constant ball dropping.... Blitz is turning in to a 40% wr player base, and just proves time and time again, that getting excited about new content will just be a slap in the face. Yeh, and what he said... BC they needed it last update as well lol! So I updated my client and said that i need to download 300+mb of files. Then when it was done, it asked to download for another 1.3GB (which is the whole game files which i should have already have) but now it is deleted. EDIT: Finished redownloading the game, And it is still asking to update my client. Just wow! No more war chest for my birthday I guess. Edited by Bakemonotank, 11 November 2015 - 07:42 PM. on every map there is now a "skip" that wasn't there before. I usually have a ping of around 120 or so. This acts like a lag... I'm driving along or fighting and the image skips like there was a nanosecond lag. I've crashed the app 2 times trying to message people and the app has froze 2 times trying to message someone. I don't like that you have to do an extra step now to see what friends are on. The service record takes longer to load. So far I like Canal. The new friend list is wonky. You have your clan mates, then if you hit the friends list, it shows your clan mates again, plus your friends. If you're going to go to the trouble to separate it, you should have one drill down called Clan with only your clan mates there, and one drill down for Friends that has your non-clan friends. Agreed. I want to see a chat layout make-over. Maybe use a tabular layout to match the rest of the game? Still can't download new version. How bout we do 2 updates a year so we don't have to go through this [edited]all the time. I'm so pissed right now. That means new content would take three years. No thank you. How about stating what device type you are on so someone might be able to suggest something useful? Without knowing if you have iOS or Android I am completely unable to help you. Other than that nothing seriously wrong to report yet. But this is a major annoyance. So, as I have asked the WG staff about the possibility of a Supertest programme as there is in XBox, and got the " not happening" answer from the Devs maybe it's time to rethink this and set up a Supertest programme that selected players can test out all new updates prior to going live. This way most of the major bugs are ironed out so the Wot Blitz community gets the best available upgrades. It's so frustrating to upgrade and have bugs that could have been dealt with prior to going live. I have been a Supertester for WOT XBox and I believe that this would be one solution to bug ridden updates, but I do not think there is any appitite for this at WG. Maybe I am wrong but maybe just maybe this is something that should be considered? Versus the stats area which is expanded beyond it's borders on my phone for no apparent reason. It was perfectly fine the way it was before and more difficult to view now. the copy is actually superimposed over part of the tabs at the top. Thank you for the new map. Please put chat and stats back the way they were before this last update. it it now day two. I had to reinstall the game twice. The game freezes upon entering the chat. Regreting paying for 1 yr premium subscription at this point. FIX IT! I agree that the chat function is less usable now than it was before. 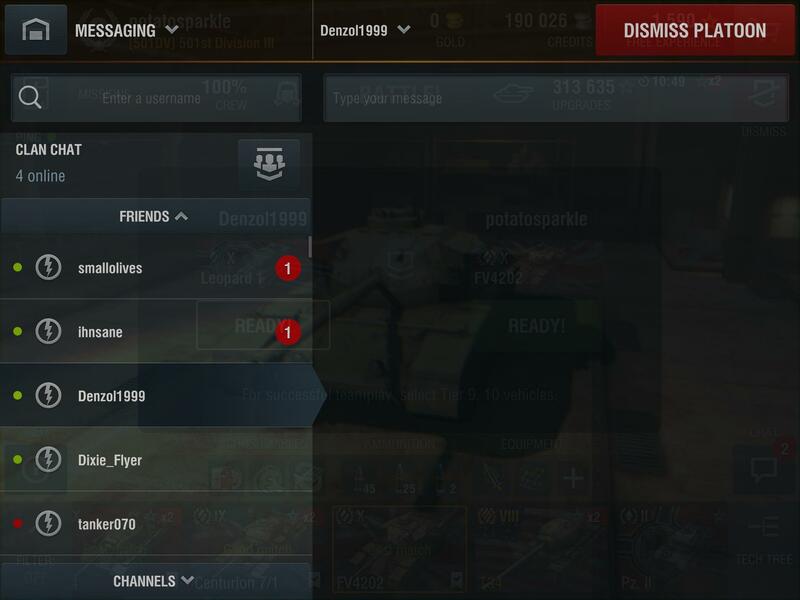 I have hundreds of friends and it is harder for me to find them or send out platoon requests. I still have an issue with missions. I keep getting Tier X missions constantly. I have 2 tier X tanks and have played only 2.5% (just over 300) of my games in tier X. I don't mind getting X missions but not all of them. I have over 5500 battles in tiers 7 & 8 (45% of all games that I have played) but I have had maybe 5 tier 8 missions. Can we get missions based on the tiers you play the most? Edited by pgrass101, 12 November 2015 - 04:13 PM.